When my fresh face, at the naïve age of eighteen years, made its debut in London Town I had only visited the city maybe four or five times. These few visits included the one (Golden ticket) university interview which gave me the excuse to gallop my way down here from the North-West in the first place. In the early days of my residence my Mum worked down here a reasonable amount, and I saw her quite a bit – which was always a pleasure (read: free lunch and shoes). Unfortunately due to lots of unforeseen circumstances her opportunities to visit are becoming less and less. As a result I was delighted when she wanted to come down on Friday to catch up (not just for free food and shoes!). Despite my Mother’s lack of cooking ability, of which I can assure you she freely admits, she is, thankfully, interested in eating. So, considering the comment made in jest above I charged myself with the task of finding a great restaurant for dinner. 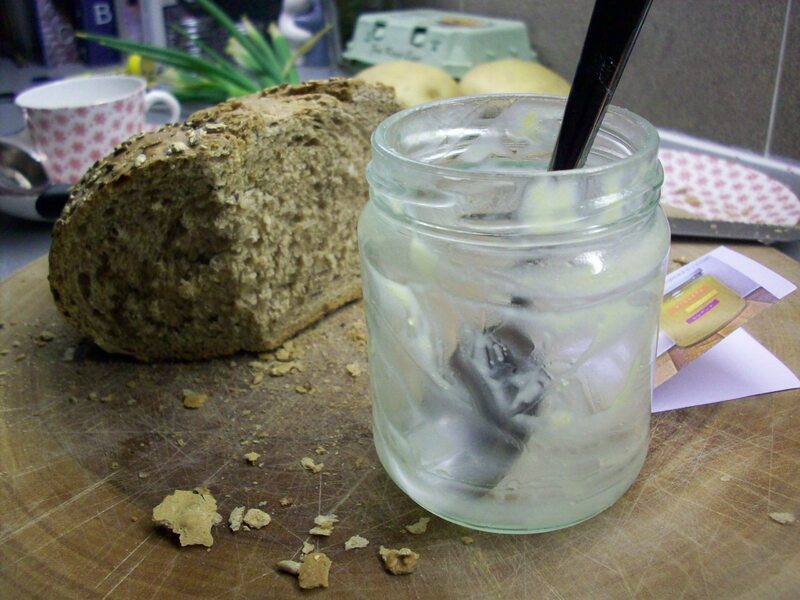 Also, once again I am blighted with poor quality iPhone photos, but I have now ordered a digital camera, hooray! 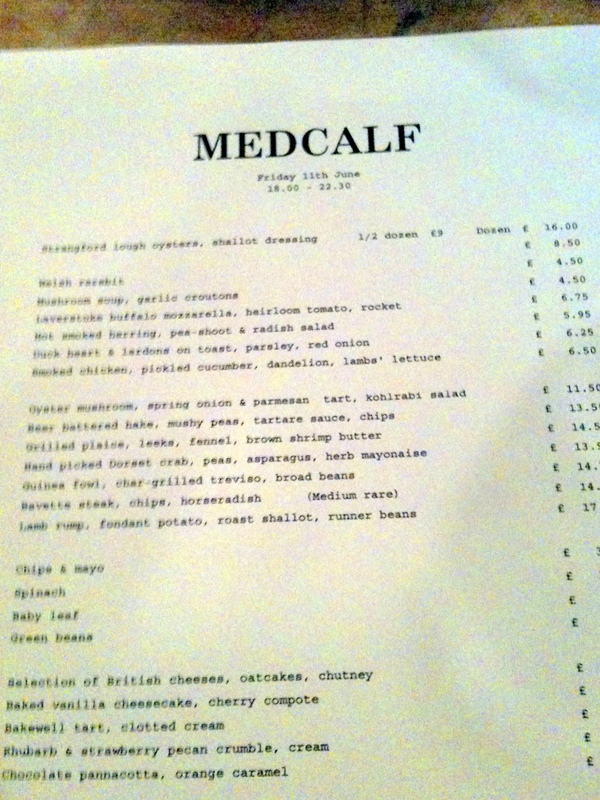 I have walked past Medcalf many times, as a former Clerkenwell resident and [current] lover of Exmouth Market I would wander past there on a pretty regular basis, but I had never got round to eating there, until Friday. As a renovated/transformed early twentieth century Butcher’s shop the exterior of Medcalf reminds me of several Brooklyn and downtown Manhattan bars. It has that shabby, mismatched furniture, inside chairs outside thing going on which, although often overdone, I actually really quite like. Inside, the bric-a-brac furniture theme continues and the overarching material used is wood, I suspect to stay reasonably true to its Butcher’s block past. Incidentally, I don’t usually notice artwork in restaurants but Medcalf had some absolutely stunning textile pieces by Charlotte Jonerheim on their walls. 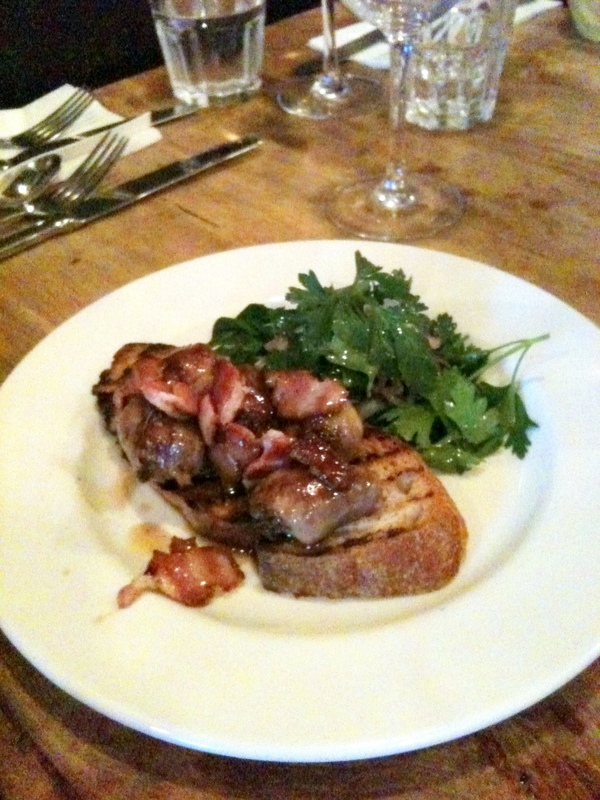 To start we shared a dozen Irish rock Oysters and Duck hearts with Lardons on toast with parsley and red onion. 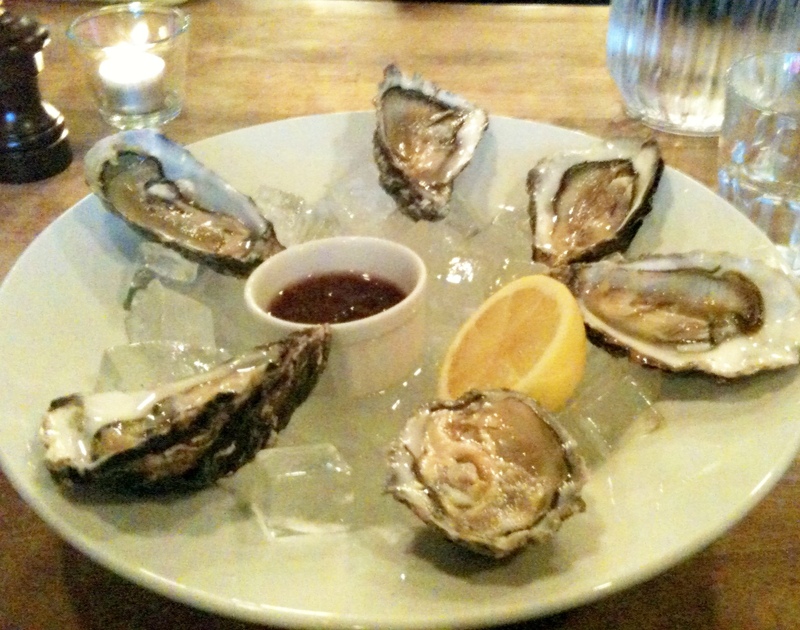 The Oysters were lovely, with a solid Red Wine vinegar and shallot dressing. The star of the show however, was the Duck hearts. Just pink in the middle with salty lumps of pig and the well matched garnish of parsley and red onion on a good sourdough toast. Absolute meaty heaven. I was also slightly surprised at the size of the hearts, they were quite small, and maybe somebody can tell me why? I remember wild Duck from my childhood always being smaller and almost wiry as opposed to the fat packaged version you see in supermarkets, but I’m intrigued as to whether this is why the hearts seemed proportionally off to me?! I continued along the meaty theme and had Guinea Fowl with char-grilled Treviso and broad beans, whilst J ate Hand picked Dorset crab with peas, asparagus and herb mayonnaise and my Mum ordered the Beer battered hake with tartare sauce, mushy peas and chips. Apologetic at this point I think she felt her foodie credentials were failing me, which is ridiculous – the only reason I never order Fish and Chips in London is because I often feel, as a Northerner with pretty high Fish ‘n’ Chip standards, slightly disappointed (as the Yorkshire born and bred Green Onions also explains on her blog). Well, I stand officially and happily corrected. Medcalf’s hake was melt in the mouth perfect. 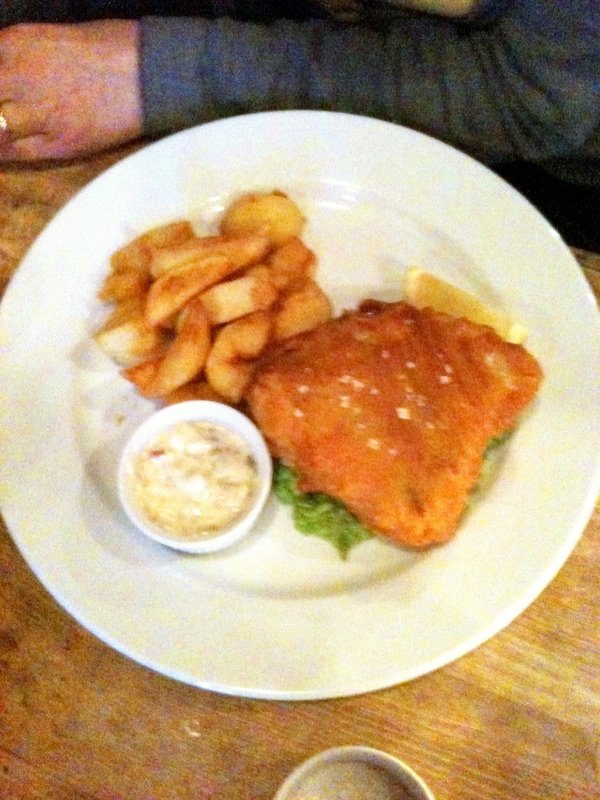 Crisp batter, beautiful fish – I cannot rave enough about this plate of food – it was divine. 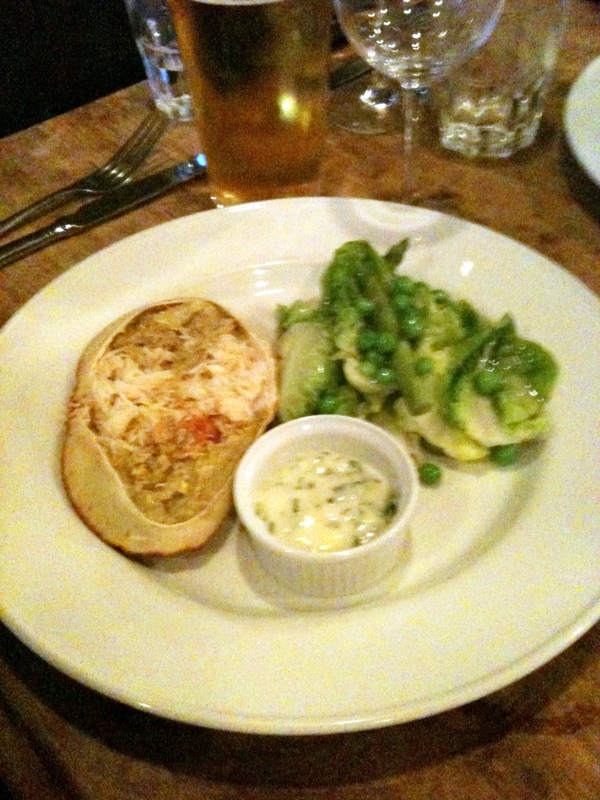 The Dorset crab was also lovely, proffered with small Gem lettuce leaves to scoop some crab and herby mayonnaise onto, it was a tasty main course. 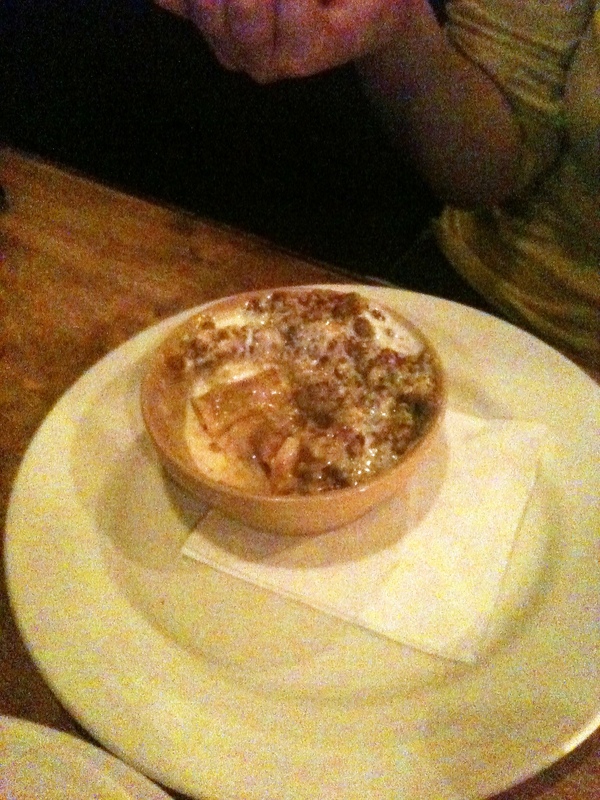 J had also ordered a portion of chips which were good chips – not the best chunky ones I’ve had in London – but pretty good all the same, and bonus points go to Medcalf for homemade mayo! 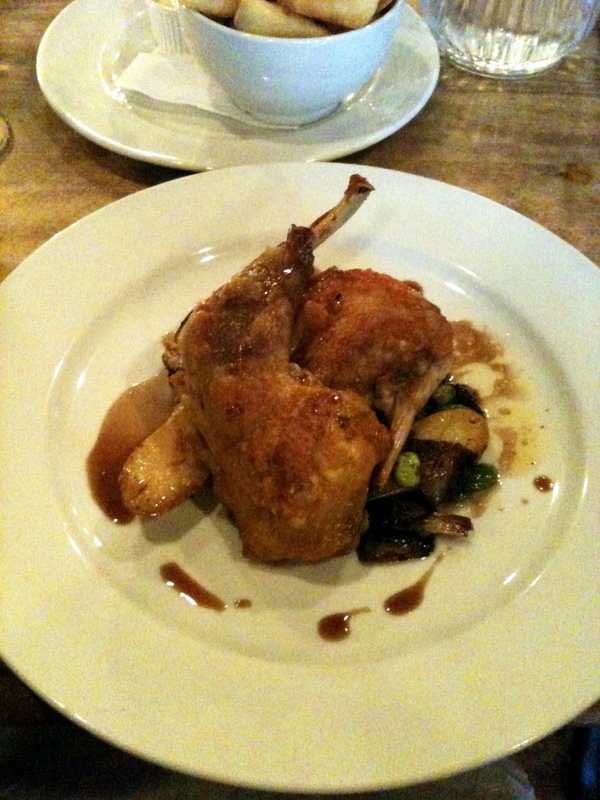 My main course was reasonably good, the Guinea Fowl was slightly over cooked and therefore a bit overpowered by the char flavour from the Treviso Radicchio. I suspect if the meat had been cooked a little less then the ingredients would have come together more cleanly. J abstained from dessert but because my Mum and I are evidently greedy (and by this point a tad tipsy – hence the lack of photos until after we had dug in!) we decided to order 3 puddings on the basis that he would eat some once it was in front of him! 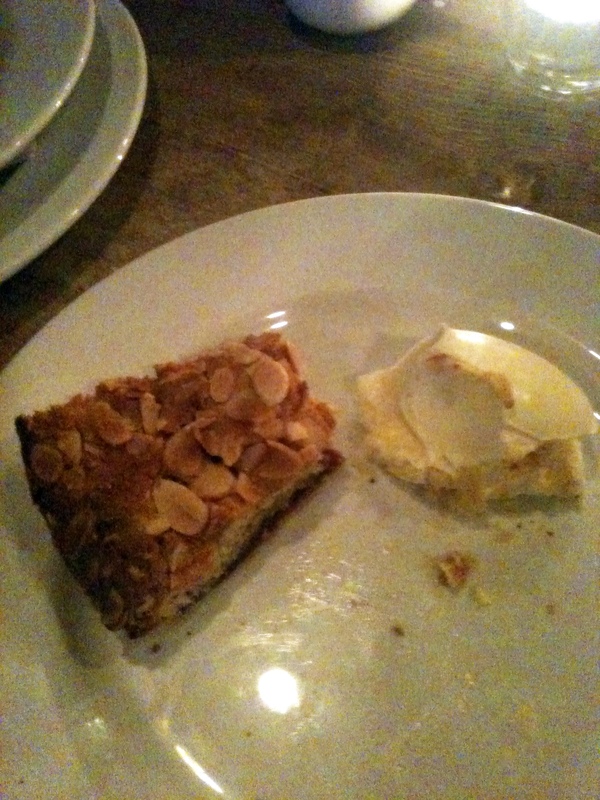 Again it was 2 hits and 1 miss with the puds, the Bakewell tart was executed faultlessly with a dollop of clotted cream and the Rhubarb and Strawberry crumble with pecans and runny cream a sharp delight. 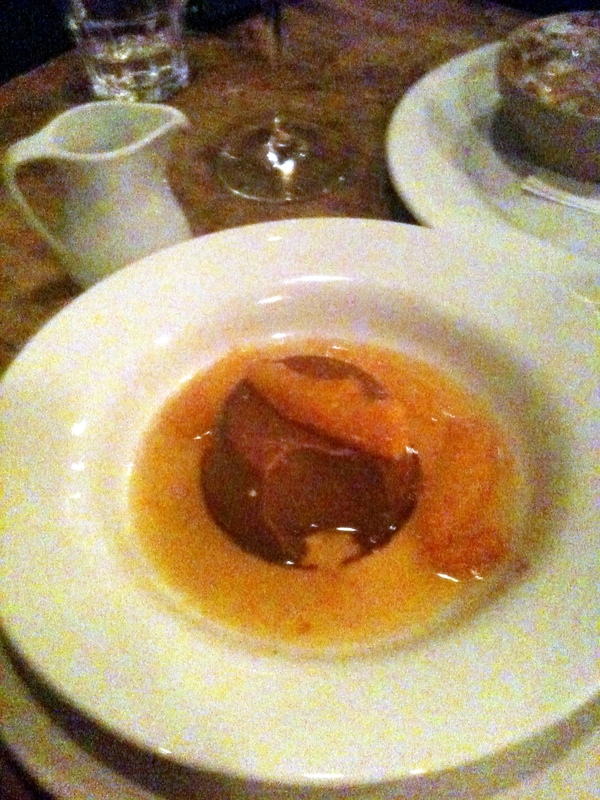 The third was the Chocolate Pana cotta with Orange caramel which although it was nice, tasted like chocolate mousse with tinned mandarin oranges, which wasn’t quite what we expected. Medcalf was mostly excellent, and when it wasn’t excellent it was still really good. The service was spot on, as were the drinks. A local Greenwich beer (Meantime Helles) had a complex taste that after a couple of sips I really enjoyed and the bottle of Rioja Navajas Blanco, 2006, was well priced and I would gladly have drunk another one. Go to Medcalf, it is definitely worth it, and whilst you’re there take a look around Exmouth market – there is so much to be seen in this corner of London, foodie and otherwise. We paid approximately £35 per head for 3 courses, including drinks.